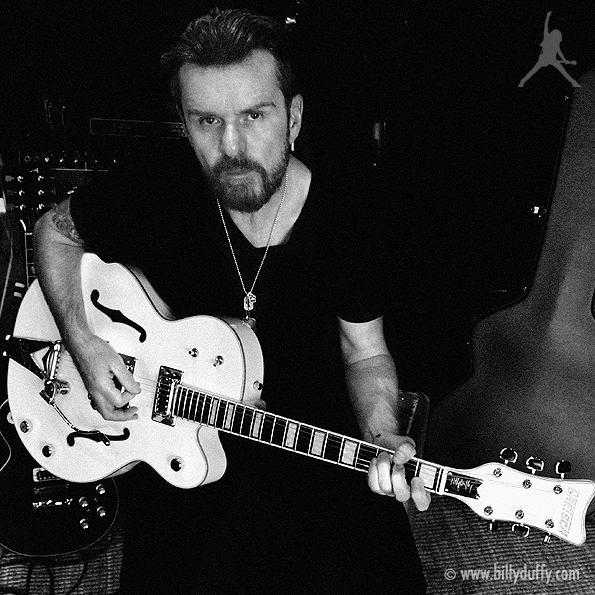 The highlight of Billy’s guitar collection is his signature model White Falcon from Gretsch. Based on his classic 1970’s version this guitar has been a labour of love as it has been created to Billy’s exact specs by the team at Gretsch. Billy explains “It’s not a forensic recreation or a replica of my original 70’s guitar because my guitars have many war wounds and scars, but it’s based on that guitar. Gretsch was made by Baldwin in the ’70s and they just built them in a different way. I don’t know if it’s better or worse than the ones they are currently selling. They differ in some ways to the Falcons they’ve got now that are more ’50s-based in terms of their construction. For example, mine has got a zero fret. They want to make it accurate and close to mine. Gretsch doesn’t have a ’70s-based Falcon as a production model, so they want my Falcon, which is better for me because I wanted it to be more widely available.